The scenario is that something 'ain't right' and I have the option of 1 - format & reinstall: 2- manual repair. 3 - run sfc(/scannow). 4 - use a reimage site. I can understand what option 1 is, but what are the pros and cons of options 2, 3 & 4 and how do I know which is the best option(s) for any given situation? What you've run into is a very common situation people find themselves in from time to time. It boils down to "what the HECK do I do?" I'll run down the options you list (at least the ones I understand), and throw in two more. Format & Reinstall is perhaps the most extreme and difficult of the lot. It involves erasing everything on your machine by reformatting the hard disk, and then reinstalling Windows, every application you use, and your data. Typically, the "your data" part is best handled by taking a full backup of everything prior to the erasing everything, so you have a copy of all your data at the time that you can copy from. The downside: it's a lot of work, and it requires that you have installation media not only for Windows, but every application that you use. And it requires that you have some way to backup your data for restoration after. "... it's often the only way to make certain that malware has been removed, while at the same time cleaning your system of the cruft that's accumulated over time ..."
The reason I often recommend it is that it's often the only way to make certain that malware has been removed, while at the same time cleaning your system of the cruft that's accumulated over time to slow it down or make it less stable. Manual Repair (at least the way I'm going to interpret what you mean) is at the other end of the spectrum. This focuses on identifying a specific problem your system might be experiencing, and determining the steps to repair exactly and only that symptom. Running an anti-virus program to remove a virus, updating a driver, or going in to the registry to make a specific change might all be examples of a manual repair. A manual repair is most appropriate when the problem is clear, isolated, and you know what you're doing. Don't read too much into that last part - "knowing what you're doing" could be simply knowing how to take a symptom, research a solution, gain some confidence from the research that says the proposed solution is correct, and then implementing that solution. How much you need to know depends on just how technical all that may get. The problem with manual repair is sometimes you might find it to be incomplete or downright wrong. It can be a time consuming process to try a repair, find that it hasn't worked, and then start the research process again and again. SFC��/scannow is the System File Checker. It's a fairly simple utility that checks to see if your operating system files have been damaged or compromised, and fixes them if so. It's simple, and there's rarely any downside to running it. There are two problems with SFC: it only works on Windows system files, and it's probably going to require your installation media as updated for the service packs you have installed. Use a reimage site - to be honest, I'm not sure what you mean by this, or specifically a "site" in this context. So I'm going to address backup or imaging software instead. One of the arguments for taking regular full or "image" backups of your machine is that you then have the ability to restore your machine to the exact state it was in when that backup was taken. Think of it as a snapshot in time. In my opinion, it's the best of all worlds - it can let you recover from almost anything, much like a complete reformat and reinstall above, but without having to reformat and reinstall. Recovering using an image erases, in a sense, everything that's currently on your machine and replaces it with everything that was on your machine at the time the image was created. Everything. The biggest downside is that it's not something you can do after the fact. You must have been taking images and backing up while your system was working, in order to have a good image to revert to when things go bad. As I keep repeating: backups are good and necessary and important, and this is one reason why. Repair Windows is something you didn't mention, but something I want to include. Normally, when we think of reinstalling Windows we think of it in the "reformat and reinstall" context: everything is installed from scratch. Windows also allows you to perform a "repair install" which does in fact reinstall Windows, but without destroying most of your settings, installed applications and data. It's a good thing to have in your arsenal of troubleshooting techniques, particularly if you have no backup (take one first, just in case) and a reformat and reinstall is impractical. System Restore - I'm mentioning this because while it has occasionally helped people with more focussed issues, I want to reiterate that it's not something that can be relied upon, and it is no replacement for backups. But sure, give it a try, it might help also. Why can't I rely on System Restore for backups? There's much confusion about what System Restore actually is and is not. In a nutshell, it's safest not to rely on it to restore your system. Just a couple of comments. A Repair Install may cause more issues than it solves depending on the original install media and what's actually installed on a machine. For example, my install disk has XP Pro w/SP2 and IE6 on it. But I upgraded my system by installing SP3 and IE7. Running a Repair Install does not work unless I remove IE7 and SP3 for the same reasons SFC might not work. Also, a Repair Install might disable automatic updates in XP as outlined in Microsoft KB555615. It can be a real hassle to get the updates you need, including SP3 and IE7/IE8 if you want to reinstall them. One website called Reimage.com says, "Reimage diagnoses operating system problems, and replaces objects detected as faulty or missing on the PC. By accessing a web repository that stores 25 million components and registry objects, Reimage repairs programs, refreshes drivers and removes bugs and glitches - while maintaining the integrity of the user data." I've never used this service so I can't speak to its effectiveness but this might be what the original poster was referring to. And this particular website says it only supports XP. It's best to be prepared, and then when things go wrong, it's easier to recover. Personally I rely a lot on the Horizon Rollback program, which I think deserves to be better known, as it is exceptional in the recovery possibilities it offers. As with System Restore, snapshots are taken (manually or automatically as desired) at intervals of the drives to be protected. Then if a problem occurs, it is possible - and easy - to revert to an earlier snapshot, even if the computer does not boot, as a preboot screen briefly appears. The snapshot disk space overhead is generally small, but can be eliminated by updating the baseline. 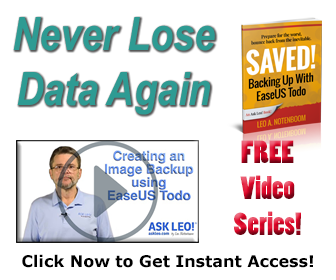 Backups, preferably on to removable media or different drives, are also useful, through the utility in Accessories, or a third-party program; at the least, a backup of the registry takes little space and can solve a high proportion of problems. I believe that it is best to keep data on a separate drive or partition, as then a reformatting of the "C" drive will not destroy it. If you are in trouble and have been using a single drive, you might still be able to use, say, Achronis Disk Manager to partition it. You could then reinstall your operating system on the empty partition and then delete all the non-data files on the other partition. Alternatively, you could install an extra hard drive for the operating system before wiping all of the files other than "My Documents" on the old drive. This should result in a faster computer, as it will be able to access system and data files simultaneously. I have never found the System File Checker to be of much use, as to begin with it does not ever work with the system disk I have available. If I force it to work by hacking the registry, it then throws up all sorts of errors: are they real errors, or just files modified by Microsoft Updates? Isn't it true that with the Image Type you area also imaging many things that might be wrong with your system such as hidden malware and the like so that you would be right back were you started with nothing solved? Yes, that is true. That's why most recovery instructions stress going back to a known good/clean image. The best solution, the one that set me free from "fighting with Windows," was to purchase an Apple Mac! I have always backed up my computer but seldom has restoration worked as promised. I have an external 1 terabyte drive used only for data backup. I would do a full C: drive backup every week as well as backup another external drive I stored all my software on that I purchased on line and downloaded. Along with the software I kept all the receipts and access codes stored and backed up as well. To double insure I was covered I saved the back up files to an online back up service. There are two major players in this market, Carbonite and Mozy, and one, Carbonite, does not allow external drives to be backed up, or at least they didn't when I first tried their service. They also didn't allow any executable file to be backed up. The service I subscribed to, Mozy, allowed both. Or so I thought at first. A recent series of PC problems including replacing a motherboard and my hard drive followed 48 hours later by a failure of the external drive with all my software on it tested the effectiveness of what I had done. What I found was the backups of my C: drive were intact and I was able to recover most of the information from them I needed. The exception was my Outlook data. While I had the ability to restore everything as it was prior to the failure I opted not to do that because my hard drive needed cleaning, so I reinstalled and updated Windows then replaced individual files as needed. The knee bending blow came when I tried to recover the software from the external drive. Even though I had backed up the external drive immediately after I backed up the C: drive and the restore program said the backups were corrupted. Searching for help at their site got me nowhere and asking for help at the forum got me nowhere either, other than some way over my head way to crack the backup files with another program and then by careful selection picking out bits of data to reassemble. Nothing else worked at all. I thought i would still be OK because my files were backed up online. When I went to the online back up service, I found that although my external drive was being backed up, NONE of my executable files, the downloaded programs valued into the thousands of dollars, were there any longer! I found some audio files, pictures, and text documents. I restored what I could, but upon inspection, most of those were missing about 60% of the data they should have contained. In some cases all I got was the empty folder. A disclaimer I found stated that data could be lost during transfer over the Internet. Apparently. And lots of it! Worse, was none of my backup files were there. It about made me sick to my stomach. By digging through boxes and file cabinets over the following week I was able to find activation codes and keys to be able to get most of my software reinstalled and working after finding it again. Many companies did not make older versions of the product I had bought available, instead trying to sell me the newest versions. Some things weren't worth the cost to buy twice. The primary lesson I took away from this is any software I download now goes into a folder that I make hard copies of to blank DVDs every month. I copy each program to CD immediately along with any receipt or codes copied to a Word document and burned onto the CD with the program. I maintain a folder for all the receipts and activations that gets copied to CD and DVD as well. I make CD or DVD backups of My Favorites, My Documents, and Outlook pst files. I still do my weekly backups and make sure I have a current image snapshot recovery disc made, or whatever it's called. I still have not resolved what caused the external drive backups to be corrupted, especially when they completed I got a message saying they were completed successfully and had passed verification. I use backup software (Acronis True Image Workstation with Universal Restore)that will allow me to reinstall my C drive contents to a different hardware configuration. I learned the hard way that with some backup software changing the size or even brand, in some cases, of the primary hard drive will screw up or prevent the drive contents from reinstalling (this was an early version of Retrospect). I am talking here of the type of restore that re-creates a clone of the backed up drive in its entirety, not where you pluck out individual files to restore. I am also researching online file storage where I can just rent space and put what I like there. While I can understand why Mozy would not want to store executable files, in this day and age it seems a little like having a parking lot that doesn't allow cars. The moral: I don't know if there is one. Backing up is important, but it seems none of the tools available for doing it are perfect. Advertising being what it is, dirty little secrets like only being able to do a full restore to the same computer with the same exact hardware easily lull consumers into dropping money for products that are limited at best. Thinking back to my first big honkin' Dell PS2 with it's massive 10 GB hard drive, I backed up to CD-Rs and while it gave me a sizable stack of them, I was always certain there was a viable, accessible copy of my data within reach. Reformatting is the best option if Windows has been installed for 12 months or more. I like reformat every 6 months - just because. I once waited to see how long my machine would last before it became unbearable-17 months. And I perform routine maintenance every week. So, I figure that Windows becomes basically unstable after 12 months. Credentials: I've been involved in electronics for over fifty years, and with computers for over thirty-five years. For the past twenty-six years, I've been a programmer, network specialist, Pc builder and repair guy, and somewhat of a security expert. 1.) The most likely component to fail on a "consumer grade" Pc is the power supply. Many problems that appear to be software related in fact are the result of a faulty power supply. For about $10 to $20 you can get a very simple to use power supply tester. If the -5VDC LED fails to light up (most likely problem) the Pc will do all sorts of strange stuff. From experience, I have learned that before I even the power on, I disconnect all of power cables and plug in the P.S. tester. In nearly 50% (or possibly more) of all cases, the P.S. is the problem. Why? Because those who make a cheap Pc (consumer grade as opposed to professional grade) use grossly undersized power supplies. In some cases I've seen power supplies that deliver between 90 and 165 watts--MAX. Plug in a few peripherals such as USB devices, and the P.S. dies quickly. 2.) Hiding inside each Pc there is a tiny battery, about the size of a quarter. In some cases, a different battery technology may be used, but that is rare. The life-span of a lithium battery is three to five years, but can be a lot less. Therefore, I always yank out the battery and test the voltage. Don't leave it out too long, or your CMOS will be sent back to factory defaults. It may sound risky, but you can, while leaving your computer turned on, carefully remove said battery and test it without any fear of losing your current CMOS (BIOS) settings. 3.) Bad RAM. Some motherboards will have as many as four memory slots, others, only two. By removing the memory module in the primary slot, and placing the secondary RAM module, or better yet, using a known to be working RAM module that is of the proper speed and type for your Pc, will often turn up a major clue. If the memory module is failing, the results will mimic all sorts of software failures. b.) No matter the source, the HD manufacturers don't guarantee any sort of data recovery. They will replace the drive, but it will be with a completely unformatted unit that needs to have all software, drivers, add-on software--including the operating system, replaced using CD's that you may not have even received when you purchased your Pc. c.) Drives replaced under warranty are usually re-labeled as "re-manufactured." Sometimes you might get lucky and get a brand-new drive. But that is rare. d.) At the moment, Seagate offers the best warranty for off-the-shelf drives: five years. Other manufacturers only offer one year!!! But once again, if included in a factory-made, consumer grade Pc, the warranty on a Seagate drive may be limited to one year. 5.) A final comment (although I could make hundreds more) is that sometimes a peripheral, which might even include a CD-ROM, CD-RW, DVD ROM, or DVD-RW may be causing a problem, simply because that happens. Often-times, it is nothing more than the cable connecting the auxiliary device to the motherboard. Also, many a Pc still comes with a dial-up modem. If you are using high-speed Internet, that modem is probably useless (unless you are using it for faxing over a land-line.) Hence, removing it and all software related to that modem may resolve all of your issues. Well, sorry for using so many words, but I think that your readers need to consider hardware BEFORE they start tinkering with software issues. Use drives other than C: to keep data and backups. 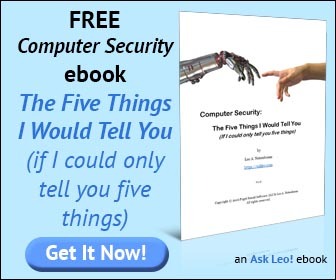 Use a good firewall, a separate anti-malware program and a good anti-virus program. There are some antivirus software (check PCT website for a good freeware additional AV) designed to operate happily along with others and any extra compatible products will help. Avoid any AIO software, or use the best part of such a product only. Although all of the six programs I use are freeware, they have been doing a great job and I never had to reinstall XP in the last four years. Consider a good power supply with some extra power and a good additional high quality hard disk for backups. If the hard disk is external, it can be turned on only when required, although modern hard disks have exceptionally good MTBF's. Glenn said: "I won't name names here, out of fear of a lawsuit"
I completely understand your hesitation, given the litigious society in which we find ourselves, however could you give some general advice regarding determining which is which, and where to look for "professional grade" equipment. I think it's safe to assume that anything at a Big Box store is going to be consumer quality, but where do you go for the good stuff? I haven't bought an out-of-the-box system since my Commodore 64; I've always had mine built. My dealer has never mentioned the quality levels to which you refer. Oh sure, he would advise on "bang for the buck", ie: which CPU or HDD is more cost effective at that point in time, but that's not what you are talking about. If there's something that you don't want to post (brand specifics, etc), please email me at [email address removed]. I'm in Canada, so that would probably affect availability and definitely would make a significant difference in cost. All I have is one thing to say "Windows Home Server" If you have not looked into this you are truly missing out!!! I remember when losing a hard drive was the end of the world, now, it�s just inconvenient. I'm a great fan of the image backup option. It's dug me out of more than one problem situation. Having regular image backups is just so much simpler than trying to resolve one of those "something's recently gone wrong but I don't know what or how to fix it" problems that are so common in these interconnected times, and sure beats spending a couple of days hard work to rebuild everything from scratch. (I've done that too, and I can't say I fancy doing it again!) I run regular backups each night after I'm done for the day, checking the "shut down when completed" box in the final dialogue. Then I just walk away and the PC shuts itself down when the backup is done. I purchased a popular internet security suite from a national retail chain here in the UK and it's been running fine for quite a while. Recently I got an email, purportedly from a survey company engaged by that retail chain asking me how satisfied I was with the product and with their service. Clearly they new I had that particular product and where I had acquired it. It all sounded very reasonable so I decided to respond. I committed the cardinal sin by following a link to a customer satisfaction survey given in this unsolicited email - big mistake! Within a day or so of completing the survey telling them how satisfied I was that very same product crashed at boot time, and thereafter failed to work at all. It didn't take me long to realise I'd been stupid and had paid the price for it. You mentioned SFC, System File Checker, in your article on recovery options and I have read several of your other articles on SFC and have a followup question on using the SFC /scannow option. In one of your articles on SFC you provide a link on how to direct the computer to find a copy of the Windows Installation CD on the HD. SFC /scannow does not provide the option of directing SFC to the HD to get the original Windows files. OK so now how do I get SFC /scannow to look in an existing directory for the original Windows files? As a followup on this question SFC /scanow may also ask for the CD containing the SP files and I do not have CDs of the Service Packs and I expect that 99% of the Windows users do not either so is there also an original copy of those files on the HD and where are they? SFC just looks wherever Windows thinks your installation media is. That could be a copy on your hard drive or if not, it could request that provide the CD. If you change the location using How do I tell Windows where my I386 folder has moved? then SFC should use that new location as well. When you install a service pack, my understanding is that the files may also be copied to a location that SFC can use later. Thus in many cases SFC still works if the original CD files are on the hard drive, and the service pack files are on the hard drive. Unfortunately if that's not the case, then the only other alternative is to get or create a CD that has Windows including the current service pack "slipstreamed" as part of the CD. That's why I say in the article "If you've installed service packs for the operating system after having received your media, you may not have the media that SFC might require." - In other words SFC may not be an option. If the system is still functioning, even if crippled, I can tell the program to overwrite the OS partition with the last-good image, then I reboot, and I'm back in business. If the system is frozen or won't reboot, I insert a bootable CD, run the "emergency" version of the program, rewrite the OS partition, and I'm back in business. Backing up/imaging/ghosting the essential parts of your machine can be very, very easy, and restoring them can be just as simple; it's never exactly a time machine, but compared with the alternative, it's back to the Golden Age. I'm not selling Paragon HDM - it's just the one that works for me. Find something that will image the essentials easily (your data drive is different, right?) and restore as easily. Do it, dammit. No arguments, please. Apparently I used a character ("less than", as it happens) in my earlier submission, which caused a large chunk - in fact the most significant chunk - of my message to disappear. I said something to the effect that: "Using this program, in under 10 minutes I can back-up , in a similar time I can restore, the essential 5G of operating system and Program Files". Reimage �� Official Site I downloaded this program from an ad on the Ask Leo site, and ran the scan. I liked what I saw, so I purchased 3 keys for three machines and used it on my XP PC. It took a while, but when it was complete, the increased speed was immediately noticeable. However, I'm now having to update the XP security, as in 69 files in one update. The speed is still there, but I wonder if you have tried this product and what your thoughts are.